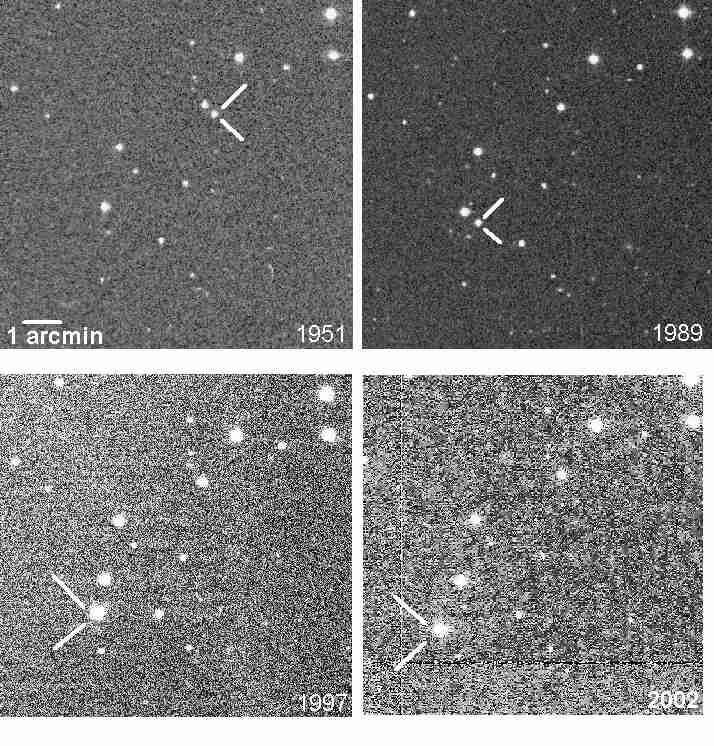 In February 2003, a team of astronomers (including Bonnard J. Teegarden, Steven H. Pravdo, Michael Hicks, Stuart B. Shaklan, Kevin Covey, Oliver Fraser, Suzanne L. Hawley, Thomas A. McGlynn, and I. Neill Reid) announced the discovery of a nearby star using data collected by the NASA-funded, Near Earth Asteroid Tracking (NEAT) program from November 26, 1997 to August 11, 2001, during a search of nearby white dwarfs. Designated SO025300.5+165258, the star has a very large proper motion of 5.06 +/- 0.03 arcseconds per year (Teegarden et al, 2003), which was detected in SkyMorph's database of NEAT observations that astronomers have found to be useful for finding stars with high proper motions (Pravdo et al, 1999). Some astronomers have begun referring to SO 025300.5+165258 as "Teegarden's Star," after its discoverer Bonnard J. Teegarden. 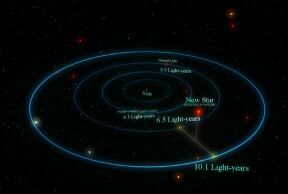 Astronomers currently know of only six other stars with proper motions greater than five arcsecconds per year, from the perspective of an observer in the Solar System. more than 50 years ago. Teegarden's Star is located in the southwest corner (2:55:10.6+16:17:1, J2000; or 2:53:0.5+16:52:58, ICRS) of Constellation Aries, the Ram. It can be found southeast of Hamal (Alpha Arietis), Sheratan (Beta Arietis), Mesarthim (Gamma Arietis), and spiral galaxy M 74; northeast of Alrescha (Alpha Piscium); and northwest of Lamda, Mu, Xi2, and Nu Ceti, and Menkar (Alpha Ceti) and Kaffaljidhma (Gamma Ceti). 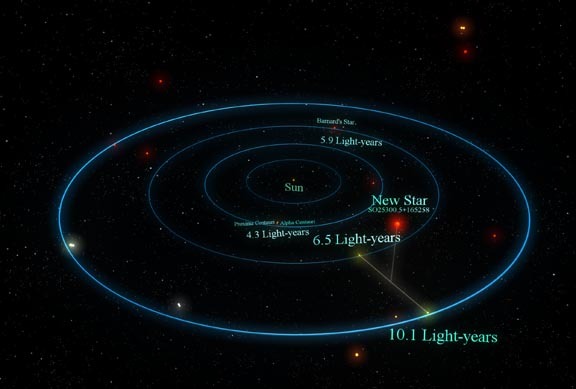 If the initial distance estimate had been confirmed, the star would have become the new third-closest system to Sol after Alpha Centauri 3 and Barnard's Star. Like all red dwarf stars, however, Teegarden's Star is too faint to be seen with the unaided Human eyes from Earth. 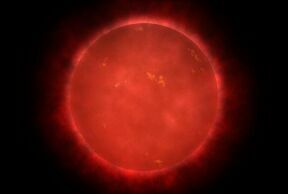 Initial measurements of the spectrum of Teegarden's Star and its tangential velocity (of 52.9 +/- 11.7 kilometers per second) suggest it is a main-sequence dwarf star of spectral and luminosity type M6.5-7.0 V. Such a cool red dwarf star is substantially smaller and dimmer than Sol, currently estimated to have only around eight percent of Sol's mass, around one-seventh of its diameter, and 1/300,000th of its visual luminosity. If the preliminary distance measurement had been correct, then the star would be underluminous by a magnitude of 1.2 +/- 0.7 (three times dimmer than similar stars of its type), although the relative strengths of the star's spectral bands of Calcium Hydride (CaH2) and Titanium Oxide (TiO5) provide no evidence that it is metal-poor. The star's relative distance to Sol has been revised as initial estimates of magnitude and distance indicated that the star had an unreasonably small diameter of 68 percent of Jupiter. Subsequent measurements of magnitude and metallicity suggested that the star is actuallyed located around 11.7 ly away, based on an inferred, spectrophotometric parallax of 3.6 +/- 0.4 arcseconds (Teegarden et al, 2003) -- more discussion at RECONS. A more precise measurement of the star position to improve the determination of its trigonometric parallax distance was launched by the U.S. Naval Observatory. 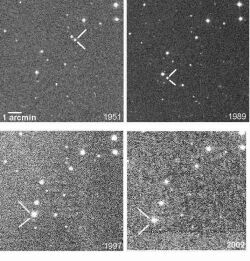 In June 2004, George Gatewood (Director of the Allegheny Observatory) also reported a similar, initial parallax estimate of 0.259 +/- 0.004 arcseconds (AAS 204th Meeting session summary), for a distance of 3.86 +/- 0.06 parsecs (12.6 +/- 0.2 ly), a distance modulus of 2.067+/- 0.034 magnitudes, and an absolute visual magnitude of 17.47 +/- 0.04 (A.O. abstract) -- "in excellent agreement with those of the U.S Naval Observatory (Conrad Dahn, private communications." Useful catalogue numbers for this star include: SO025300.5+165258, SO25300.5+165258, SO J025300.5+165258, 2MASS J02530084+1652532, APM EO0425-0315372, LSPM J0253+1652, and USNO-B1.0 1068-00028941 or USNO-A2.0 1050-00774305. 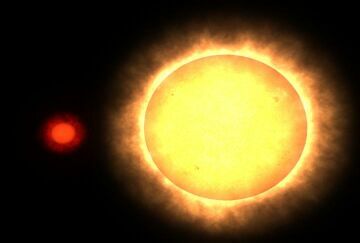 The following star systems are probably located within 10 light-years of Teegarden's Star. Up-to-date technical summaries on this star may become available at: NASA's ADS Abstract Service for the Astrophysics Data System; and the SIMBAD Astronomical Database mirrored from CDS, which may require an account to access. Around 1800 BCE, the relatively dim stars of Constellation Aries, marked the coming of Spring for Humans of Earth's northern hemisphere. One myth of the Ancient Greeks associated with Aries, the Ram, involved the God Hermes who sent Aries to save the life of Prince Phrixus. The Ram carried Phrixus to a land near the Black Sea called Colchis (the capital of which was Aea) and asked to be sacrificed to the Gods and to have his Golden Fleece be given to King Aeetes. For more information about the stars and objects in this constellation, go to Christine Kronberg's Aries. For another illustration, see David Haworth's Aries.